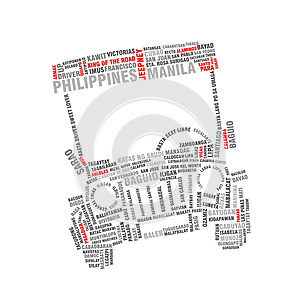 Abstract Philippine jeepney word cloud illustration, manila and other key cities in the Philippines. Jeepneys, sometimes called simply jeeps, are the most popular means of public transportation in the Philippines. They are known for their crowded seating and kitsch decorations, which have become a ubiquitous symbol of Philippine culture and art (wikipedia.org). Compose of names of famous cities in the Philippines that resembles an illustration of jeepney, this creative word cloud illustration of a Philippine jeepney or jeep is great to use as visual for magazine or blog articles about travel or cities. It can also be use as as web or application icons, design for t-shirt prints, stickers and others.